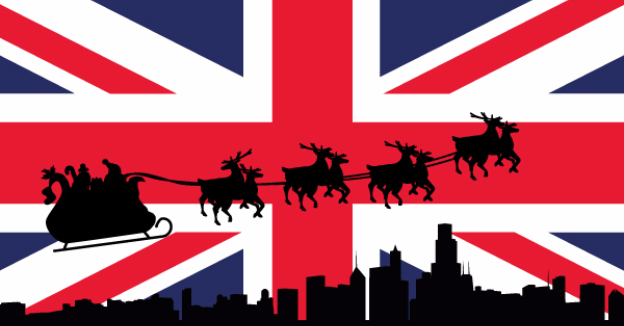 If you’re studying abroad in the UK, you’ll find that the majority of native students will leave campus over Christmas and head home for the holidays.If you don’t celebrate Christmas as an international student, you may be unaware of some of the customs and traditions that take place in the UK. In the UK, and a lot of other countries that celebrate Christmas, such as the USA and Australia, Christmas is a time for families to come together. Presents and greetings cards are given to friends and family and a traditional turkey dinner is cooked on Christmas Day, with families travelling far and wide to be together over the holidays. Whilst Christmas Day itself is celebrated on the 25th December, the Christmas period is commonly acknowledged to last from December 24th – 2nd January. Christmas decorations, including wreaths and trees, adorn commercial properties and homes. Festive foods are eaten such as mince pies, Christmas pudding, mulled wine and yule logs. You may see groups of carollers going door to door singing Christmas songs and you’ll definitely hear some festive tunes on the radio. Christmas markets pop up in cities across the UK, selling ornate gifts and festive food and drink which attract busy crowds during December. No matter what university you’re attending, you’ll no doubt see a Christmas market or two if you head into the city centre. On Christmas Day itself, most shops and businesses will be closed so don’t expect to get much shopping done. Although after Christmas, almost every shop partakes in the “January sales” so you can expect to grab yourself a bargain! Staying at university over Christmas? Whether you celebrate Christmas or not, if you’re an International student staying at university and spending Christmas in the UK, you may feel a little disorientated. It’s completely normal but you won’t be alone.Here is our advice for international students who are staying at university over the Christmas period. There will be no classes over the Christmas period but things like the library may still be open for limited periods. You might find it helpful to fill your time catching up with university work or revising for exams. With no distractions, it’s the perfect time to get ahead. Some universities put on festivities for students who are remaining on campus. Whether you celebrate Christmas or not, getting involved in the celebrations is a good idea as it can stop you feeling lonely. New experiences is what university is all about and you may find you love some of the UK’s Christmas traditions! You won’t be the only international student remaining on campus. Gathering together over Christmas and sharing each of your own Christmas traditions (if you have them) with one another can be entertaining and a great way to have fun over Christmas. Each of you could cook a traditional dish from your home country and have one big dinner together. If you make good friends with another student during your first few months at university, they may invite you to their home to spend Christmas with them. If you accept you’ll get to experience an authentic, traditional Christmas in the UK. You can also use Host UK who can arrange for you to spend the holidays with a family!Studying abroad can be a little overwhelming, especially during Christmas and it’s important to remember that it’s normal to miss your friends and family from back home. Feeling homesick is completely normal but the best thing to do is keep busy. Christmas is a magical time of year and if you can deal with the cold weather – there’s no reason you can’t enjoy your time here in the UK.